Around a dozen of us got together at last night’s inaugural NIEVO Cars and Coffee Meet. We had 9 vehicles (10 if you count the Tesla passing through), including a couple of BMW i3’s, a VW e-Golf and Golf GTE, a Renault Zoe, a Mercedes B-Class and a collection (a tree?) of Nissan Leafs. There was plenty to talk about and several shared interests came up including smart home tech and solar renewables. After a chat in the amazingly pleasant surroundings of the Templepatrick Applegreens, we took a trip outside into the drizzle to check out the hardware. 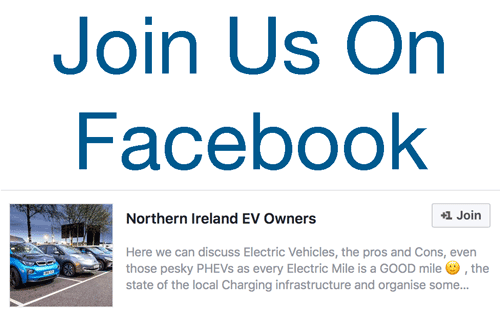 It was great to see other types of EV and share the pleasures and the pains of ownership, not least the state of the public charging network across Northern Ireland. This is something we all agreed we’d like to see improve and we aim to contact an MLA or two for their help. We’re looking forward to our next gathering and aiming for a Sunday afternoon. Follow us on Twitter to keep an eye out for the date. Thanks. 7 Comments on "NIEVO First Meet: The Photo Report"
Fab gathering….next time Sprucefield? we can get some.food! Thanks for organising. These meetings were threatened a few times on Twitter but it took someone to pull it all together and now we have NIEVO. I echo everything you have said already, very informative evening in pleasant surroundings with like minded people. Looking forward to the next meeting already based on some of the ideas bounced around last night! Doh! I’m sorry I missed this! I’ll look out for the next meet. “We ( the council) will not be able to deal with enforcement on E-car spaces in isolation of the larger piece of work that we need to complete on the whole area of how council set about monitoring and managing the use and administration of car parks. Reply from Ms Canice O Rourke, Director of Regulatory and Technical Services, to MLA Sean Rogers, 18 th Dec 2015.